When I was a kid I’d hop on my Huffy bicycle and off we’d go with a couple of buddies in tow of course. Jumping off curbs in the Five Oaks Neighborhood of Dayton, always ending up at the Dayton Art Institute speeding down the driveway in front of the museum with the wind in your face, you felt like it was 100mph. Those were the days, but when I look back it all, we were sorta limited to where we could bike and of course darting in and out of cars wasn’t the best idea. Well, now I can still take that neighborhood ride, but can jump on the wonderful bikeways that abound here in Montgomery County. There are more than 70 miles of bikeways in Montgomery County and nearly 330 miles of paved, multi-use bikeways in the Miami Valley. 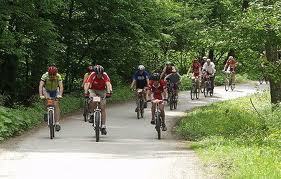 The network of “greenways” can get you where you need to go for business and pleasure. Great Miami River, Creekside, Iron Horse, Mad River, Stillwater River and Wolf Creek Bikeways criss cross the county and beyond. But don’t take it from me, my good friend Kris Sproles who lives in Huber Heights, hops on the trail off of Rip Rap and is a recent biking convert. “We are so lucky to have these great trails in our backyards and please wave if you see me on the path (I will be the guy with the bugs in my teeth from smiling while riding.) 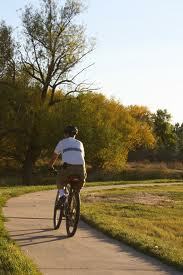 When I&apos;m on the path I can leave my worries behind me and just focus on the trail and myself.“ says Kris. For more information on biking in Montgomery County or around the valley visit www.metroparks.org and click the ‘Bikeways’ link. Please Note: The Dayton CVB has compensated me to share my thoughts on The Many Bikeways of Montgomery County.